Q. Where are the microform? Microform are stored in the Hoge building and need to be requested. If you need to use microform for a class, it may already be available at the Circulation desk (check your course reserves or ask at the desk). For items in Hoge, you can either request a specific article to be sent to you electronically within 48 hours or request the entire film/fiche that will be available to you within 24 hours at the Circulation desk. Find the record for the publication in the library catalog. 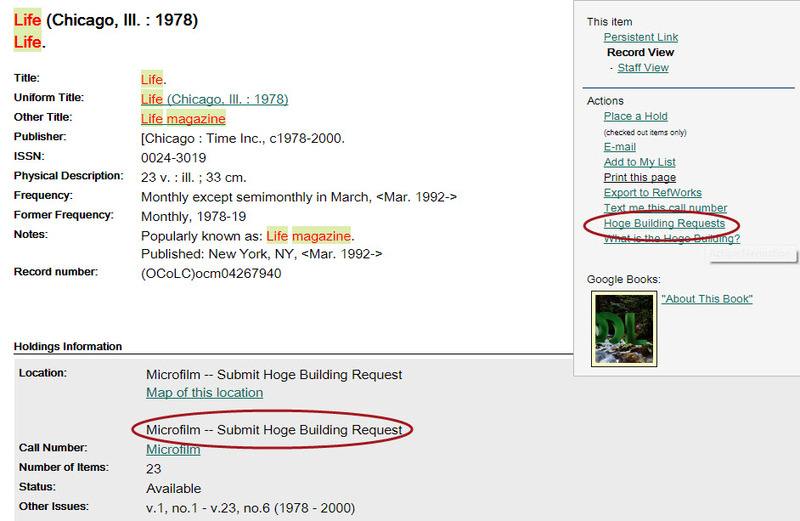 Click on the "Hoge Building Requests" link on the right-hand side of the record. Choose either the link to request a single article or the entire reel. You will then sign in with your Skidmore credentials and follow the prompts to submit your request. Contact the Interlibrary loan department if you have a question. How do I read microform?